"I will … never be ... a memory..."
The remnants of his consciousness was swept along the length of the lifestream. As with the overwhelming force of an ocean storm's overlapping waves, he was pulled completely under; unable to think, unable to even breathe, as the lifestream's current continued to drag him further and further into the depths of oblivion. With the force of his will he reached out, attempting to hold onto something, anything, within the swirling eddies of the lifestream. In an instant everything suddenly shifted. He cried out as if his lungs had burst within the confines of his chest, gasping in every inch of air as he momentarily solidified into a fragment of who and what he once was. Yet the effort was monumental, a surge of excruciating agony which was beyond the scope of mere language and words. Before long he was dragged back in, leaving behind yet another fragment of his core being. He laughed so suddenly that he almost completely lost himself within the torrent of the lifestream. It was all so simple. His torment had blinded him to what was now so abundantly clear. Closing his eyes, Sephiroth let go of the final fragments of his outer soul and dived deep, deep into the heart of the Planet and the lifestream. The prey had now become the hunter once again. It was time to find Mother. Endless Cry is a stat-based roleplaying scenario which takes place shortly after the events within the FFVII compilation. Players will take on the role of recently enlisted WRO (World Regenesis Organization) soldiers, led by Reeves Tuesti, who must begin investigating strange occurrences scattered across the globe, as a major threat resurfaces to lay waste to the Planet. Roleplaying will consist of normal descriptive prose, yet actual battles will be encompassed within a simple stat-based format. (Please see section 3 for more detailed information concerning this). The RP will be broken down into specific missions which the players within the WRO will be sent out on. At the end of each mission, players will be given a score and ranked on various factors including their battle effectiveness and descriptive posts. All that will be required from players is a minimum of 3 paragraphs per post, as all the stat handling will be done by myself. However, if players find time to put in more effort, then this could result in a better end of mission score. Improving your score and ranking up will provide access to better materia and items within the RP. In Endless Cry, when a random encounter scenario emerges, the RP will switch to a stat-based system, where the capabilities and strength of your character is determined by stats. Stats will increase by gaining experience from opponents, by improving your end of mission score, or by slotting specific materia. The main stats within the RP consists of: HP, MP, Attack, Vitality, Magic, Spirit and ATB. Random encounters within Endless Cry operates on a 'phase' structure, with each phase lasting 24 hours. This means that players can make their battle post at any time, and in any order, within a phase. At midnight GMT, that specific phase ends and a new phase begins, resetting the cycle until either the players or their opponents emerge victorious. This means that players and enemies can strike in any order within 24 hours. "Jared closed his eyes in order to steady his erratic breathing and the hard thumping of his heart within his chest. His first fight. It was nothing like the simulations and the countless battle exercises that he had only ever paid half a mind to. Those were always sterile, void of adrenaline, but this ... this was real. This was life and death. The wind was roaring all around him and the unwashed stench of the Bandit was carried along within it. For a moment, the wind battered against his jacket, but as he finally reopened his eyes, his heart had found a regular beat and his sword hand had stopped wavering. He could do this. He knew he could. He just had to focus! Not only does this simple post meet the 3 paragraph minimal requirement, but it includes the actions of the stat comprised battle whilst also breathing life into both the world and the character. Players are also encouraged to roleplay as normal and write non-battle post observations during battle phases. Though these won't specifically count towards the actual stat-battle that is unfolding, they will increase your end of mission score and rewards. Remember, the more descriptive you are in each of your posts, the better your end of mission score and special rewards that you will receive. If a player loses all of their HP within a battle, then they will be rendered unconscious. Players can be brought back to life by their comrades with the use of a Phoenix Down item or special materia. If a player is not brought back to life before the end of a battle, or if all players in the current party are killed, then a Game Over scenario will be enacted. Those players within this scenario will regain consciousness back in a nearby area with a penalty given of a 15% loss of gil (30% on boss battles), 10 random items stolen from their inventory, and the potential chance for a loss of materia. So be very careful during battle - plan your strategies, work as a team, and look out for your fellow comrades! The key to this RP is to work with your allies. Trade materia, give each other items, and work together in order to combat the threat against the Planet! Though battle composition and the exact effectiveness of your character are strictly stat-based, this does not mean that I want everyone to feel like they are giving up a sense of creativity, control or development over their characters. To this end, players will not only be able to define in what exact way their characters will level up (see section 7 for more information) but you will also have complete control over the development of your own personal Limit Breaks. With every hit against or by an enemy opponent, players will gain a point on their Limit Break Gauge. Once a certain amount of points are acquired, players can unleash their specific Limit Breaks. Players have complete control over what that Limit Break might be ... but that does come at a cost. You want your character to have a Limit Break that attacks and drains the health of your opponent? Perfect! Expect not to wait too long in order to use that. But if you want a special Omnislash style attack? Again, that's completely fine, but the penalty for such a powerful move is that you will have to wait a very long time for your Limit Break Gauge to fill up enough in order to use it. In essence, your Limit Break Gauge will accurately reflect how powerful you make each individual Limit Break. The less powerful your Limit Break, the more often you will be able to use it - it's that simple! I'm up for discussion on this, but the GM's decision is final concerning the penalty cost, and the cost is something that will continually be 'balanced' and fine-tuned as the RP continues, in order to keep things fair and a level playing field for all. Players will be granted the ability to compose a new Limit Break with every certain amount of levels, adding to their arsenal of available limit breaks. As mentioned earlier, the use of a Limit Break will use up all of your available ATB for your battle post, meaning that a Limit Break can only be used on its own, and not as an additional move within a battle post. For example, you can not use an Item, then a Materia, and then use a Limit Break within your post. Limit Breaks can only be used on their own within each battle post. 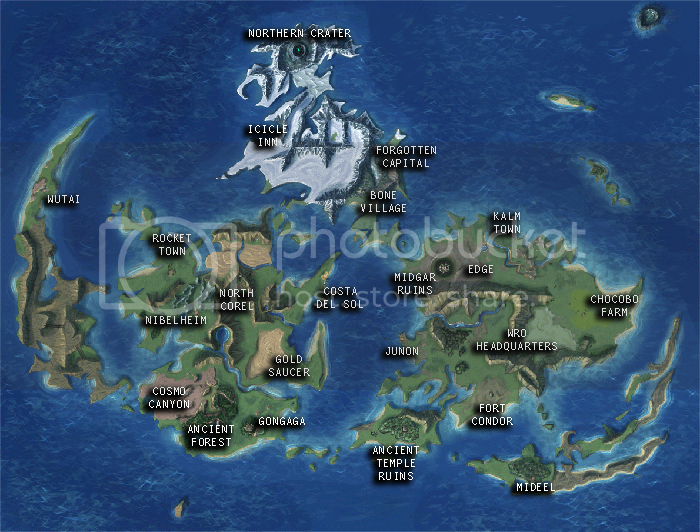 Most materia will work in exactly the same way as in FFVII. Materia can be slotted within your weapon or armor and its effects, if any, will be logged within your character sheet. Additional slots for your weapon or armor, including links to segments, can be purchased in shops around the world. So, if you think that this is something that could be quite a bit of fun, simply fill out this signup form and let's get started! Under 'type' please state what type of weapon it is: sword, nunchucks, revolver, etc... This will also determine your short or long-range capabilities. Under 'type' players must clearly state what their limit break will actually do. Is it an attacking or defensive Limit Break? Does it attack 1 opponent, or all? Does it cure your character and party? Please see the 'Limit Break' section for help on the composition of your Limit Break. Once accepted, player profiles will be located in the main thread and continually updated by the GM. Players will be given a starter pack from the WRO with some random materia and items to help get them on their way. If you have any questions about the RP please don't hesitate to ask! Sign up, join in and let's have some fun! Welcome to the KHI. You have become a part of our immeasurably powerful aggregate of souls. There's clearly a lot of effort put into this, and I respect the work you've done. Though I must note that incorporating RPG Elements into an action-based Roleplay with a potentially unpredictable posting schedule is somewhat risque. It's a bit too much customization for a semi-casual character interaction romp and may drive those new to RPing away. This seems like it would make a better tabletop game, TBH. On the plus side, if this takes off, I'd love to give this a shot. The Roleplaying Section has been in a bit of an application rut lately, and new experimentives have been passing through for quite a while now. I applaud you for trying to bring something new to the table. Thank you for the warm welcome and your thoughts! At first glance, it can seem like a lot to take in, but it was designed as such to try and provide an avenue for both new and veteran roleplayers to come together. For new players unfamiliar with forum roleplaying, it provides the 'comfort' and scope of a normal RPG game whilst introducing these new players to descriptive roleplaying basics. On the flip side, by providing veteran forum roleplayers with some fine-tuning and customization, it allows them to have that sense of control and development over their characters which they have come to expect from most roleplays. It's a fine line, but yeah, that was the ultimate intention. Before I had to leave roleplaying behind a few years back in order to study, I attempted a version of this and it worked extremely well, though that had a strictly turn-based battle system implemented with a 24 hour rule which allowed it to keep flowing. But I'm always up for experiments, so have tweaked a lot of things into this new version in order to ultimately attempt to provide more freedom. Hope you do join at some point! Once it's underway and people see how it isn't that daunting, it becomes quite a lot of fun, with a real sense of achievement from battles.